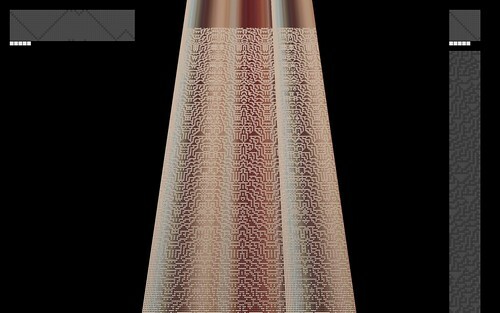 How can a textile function as a digital object? This is a central question of Infinite Weft, a project that I’ve been working on for a the last few months. The project is a collaboration with my mother, Diane Thorp, who has been weaving for almost 40 years – it’s a chance for me to combine my usually screen-based digital practice with her extraordinary hand-woven work. It’s also an exploration of mathematics, computational history, and the concept of pattern. Most of us probably know that the loom played a part in the early days of computing – the Jacquard loom was the first machine to use punch cards, and its workings were very influential in the early design of programmable machines (In my 1980s basement this history was actually physically embodied; sitting about 10 feet away from my mother’s two floor looms, on an Ikea bookself, sat a box of IBM punch cards that we mostly used to make paper airplanes out of). But how many of us know how a loom actually works? Though I have watched my mother weave many times, it didn’t take long at the start of this project to realize that I had no real idea how the binary weaving patterns called ‘drawdowns‘ ended up making a pattern in a textile. To teach myself how this process actually happened, I built a functional software loom, where I could see the pattern manifest itself in the warp and weft (if you have Chrome you can see it in action here – better documentation is coming soon). This gave me a kind of sandbox which let me see how typical weaving patterns were constructed, and what kind of problems I could expect when I started to write my own. And run into problems, I did. My first attempts at generating patterns were sloppy and boring (at best) and the generative methods I was applying weren’t very successful. Enter Ralph E. Griswold. Ralph Griswold was a pioneering computer scientist, best known for developing the string programming language SNOBOL. He spent a decade at Bell Labs, studying non-numerical computation, and went on to become Regents’ Professor at the University of Arizona. After this illustrious career in computing, he shifted his attention to the mathematics of weaving. 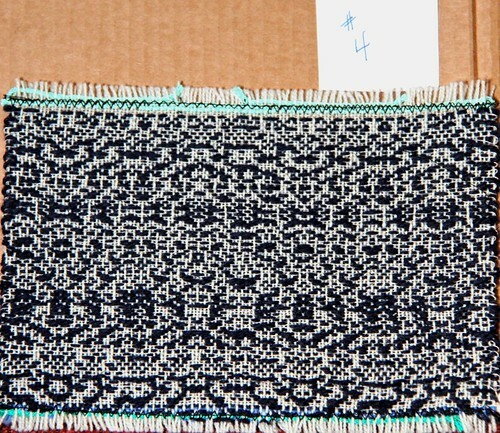 Mr. Griswold died in 2006, but he left behind a huge archive of resources for weavers and curious learners, including academic papers on pattern generation using cellular automata. While these techniques produce fairly satisfactory results, the automata themselves tended to repeat after not too many generations – while you can alternate between rules, and start with different ‘seed’ patterns, and adjust the threading of the loom to get a variety of finished patterns, the systems themselves would inevitably repeat. What about a truly infinite weft? Now we get into some pretty interesting conceptual territory. 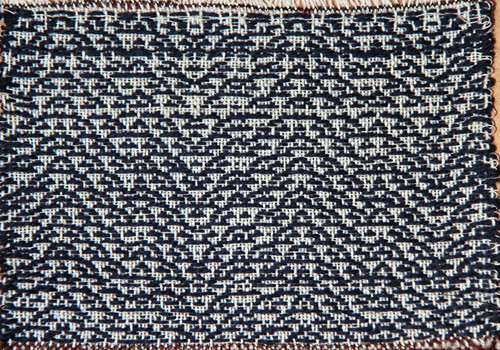 In theory, a long enough stretch of this woven textile would be Turing-complete – a computable fabric. Embedded somewhere in the pattern would be instructions to solve any conceivable problem. Past the math, this system also lets us challenge what we think of as a pattern, in a fabric context (after all, this pattern has really no pattern at all). This project is still very much a work in progress – this blog post is a peak into the process and chance to get some of my thoughts into writing. 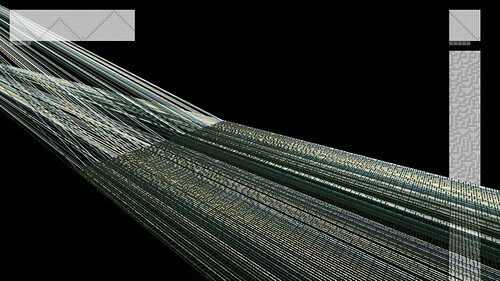 The next obvious step is to finalize work on the pattern generation, and get some large-scale textile woven from my mother’s ‘real loom’, which is a 16-harness floor loom (for this we’re going to need a computerized dobby head, which is a bit of an investment). I would also love to see other weavers outputting sections of this ‘infinite’ weft – please get in touch if you have a loom and would like to try weaving a section. Source code for Infinite Weft is available in a public GitHub repository here. And, as always, please don’t hesitate to leave a comment if you have any questions or suggestions.